When born and bred New Yorker Terry Baker Mulligan moved to Saint Louis in the early seventies, she was met with pre-conceived notions about her hometown. She says her new friends and colleagues thought New Yorkers were rude and the city was filled with trouble and uneasiness. After leaving her teaching job in 1974 to raise her growing family, she began a 35 year journey to preserve her life and focus on the goodness of the place she once called home and still holds dear. 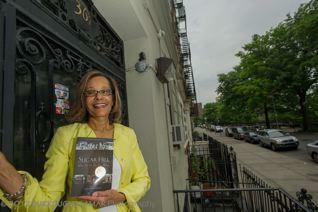 The resulting memoir, “Sugar Hill – Where The Sun Rose Over Harlem,” idealizes her youth spent in the Sugar Hill neighborhood during the fifties and sixties. St Louis Public Radio’s Erin Williams spoke with Mulligan about how her book opened the door to her family’s past and how it sheds a positive light on an uneasy time for the city.